Avon and Somerset Constabulary are appealing for information from the public following a report of careless driving in the Church Street and South Street area of Castle Cary on Tuesday 29th May 2012 at approximately 9pm. Part of Wincanton Cemetery is set aside for the graves of young children. Sometime between the 24th and 26th May a bouquet of white roses were stolen from the grave of a baby. A wreath was also damaged. Local PCSOs Mandy Forsey and Tim Russell report on recent thefts of garden shed tools in Milborne Port and silver spoons from a home in the Wincanton area. A Henstridge business owner and an isolated resident in Corton Denham have both been victims of overnight thefts between 13th and 16th April 2012. PCSOs Mandy Forsey and John Winfield have submitted details of both crimes and are appealing for information. As part of a force-wide initiative within Avon and Somerset pupils at primary schools in Castle Cary and Bruton have received lessons from the police about the consequences of breaking the law. Numerous high-value chainsaws and strimmers were stolen from a business in the area of the Henstridge Trading Estate between Wednesday 28th and Thursday 29th March 2012. Along with these items there was also some fuel and drill sets stolen. The value is approximately £10,000 for the theft of these items. 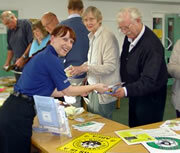 On Thursday 29th March 2012 Wincanton police community support officers presented a "Sheducation" themed crime reduction evening which aimed to help local residents keep their garden property safe. Overnight on Tuesday 20th March to Wednesday 21st March 2012, two vehicles had the fuel pipes tampered with while parked up in the Windsor Terrace area of Henstridge. Police ask the public to be on their guard. Between Friday 9th March and Monday 12th March 2012 a small low loader trailer with drainage attachments on it has been stolen from a field near Sweetacres in Holbrook, Wincanton. Avon and Somerset Constabulary are appealing to the public to come forward with information to help assist with their enquiries. Between 4:30pm and 10pm on the evening of Sunday 4th March a number of vehicles parked on the Wincanton Business Park off of Southgate Road, Wincanton suffered damage. Police are investigating an incident which happened on Wednesday 29th February 2012 between 3.00 pm and 4.00pm, where there was a theft of a number of items from a shop in Castle Cary. Avon and Somerset Constabulary are appealing for information from the public to help identify the person(s) responsible for setting alight a litter bin in Castle Cary. Between 9.00pm and 10.00pm on the evening of Tuesday 28th February a litter bin located on the Donald Pither Memorial Field was set alight. Overnight on Tuesday 21st February to Wednesday 22nd February 2012 a pair of large wrought iron gates measuring 6ft wide by 5.6ft high, were stolen from All Saints Church, Castle Cary. Avon and Somerset Constabulary are appealing for information from the public to assist with enquiries in relation to two burglaries in the village of Corton Denham. Between Friday 27th January and Monday 30th January 2012 a wooden bench and children's climbing frame were damaged in the cricket field location at Pines Close, Wincanton. The wooden bench was totally broken but staff managed to mend the climbing frame. Quad Bike Stolen From North Brewham - Can You Help? A quad bike was stolen from a farm in North Brewham in Bruton during the night of Friday 20th 2012 to Saturday 21st January 2012. Avon and Somerset Constabulary are appealing to the public to help identify a male in connection with an incident in Wincanton on Monday 19th December 2011. A male caused deliberate damage to a vehicle parked outside Lloyds TSB Bank. Avon and Somerset Constabulary are appealing for information from the public after a sheep was killed in the Slade Lane area of Rimpton on 28th December 2011. The offending dog description is a Rottweiler type dog with a long tail. We've two police reports, one from PCSO Dan Arthur who reports success in resolving a Castle Cary crime, the other from PCSO Thelma Mead seeking further information regarding a theft from Galhampton church.